These little egg candles were so handy to have for Easter this year. I made them some years ago when Kaelan was too little to really appreciate their potential, and so put them away for later years. For this reason I have no photos of the candle-making process – but it was really easy! 1) Use a sharp metal skewer to put a small hole in the top of a raw egg, and push it through so that it makes another hole at the base. Wiggle the skewer a bit so that the bottom hole is larger than the top hole. 2) Hold the egg over a bowl and blow into the top hole. After a bit of puffing the white and the yolk will come out of the bottom hole. If you have not dribbled too much in this process you can save the egg mixture for cooking! 3) Rinse your eggs out well so that there is no white or yolk left inside. 4) Make the top hole quite a bit larger – large enough to fit a thin paint brush inside – and then dry the shells out for a while. 5) Paint the inside of the shell with a bit of oil – any oil will do. 6) Using purchased wax beads, or perhaps candle stubs that you have collected, melt the max gently on the stove. I used plain white wax, but you can add colour by shaving wax crayons into the mix, and fragrance by adding a few drops of your favourite essential oil. 7) cut a length of wicking and feed it through the two holes in the egg. The wick at the top of the egg can be held in place with a peg. The wick at the bottom of the egg needs to hang out for a bit and the hole can be sealed up with blue tack so that no wax escapes as it is poured in. 8) Secure the eggs upright in an empty egg carton and slowly pour the wax in through the top hole. From memory it is important to do this slowly to avoid air bubbles forming. This is also why it is important that the eggs were dry before being oiled up – bubbles may appear on the sides which will form into hollows when your wax is cooled. 9) Leave the eggs to cool and harden. Sorry, I can’t remember how long this takes! 10) Peel the shell from the eggs and trim the wax on the bottom! And there you have it! Some cute little eggs that are ready for decorating. To decorate you can use the Stockmar beeswax. Just warm it between your fingers and press it on to the candles. Once you get over your ‘blank canvas’ block you can create anything!! 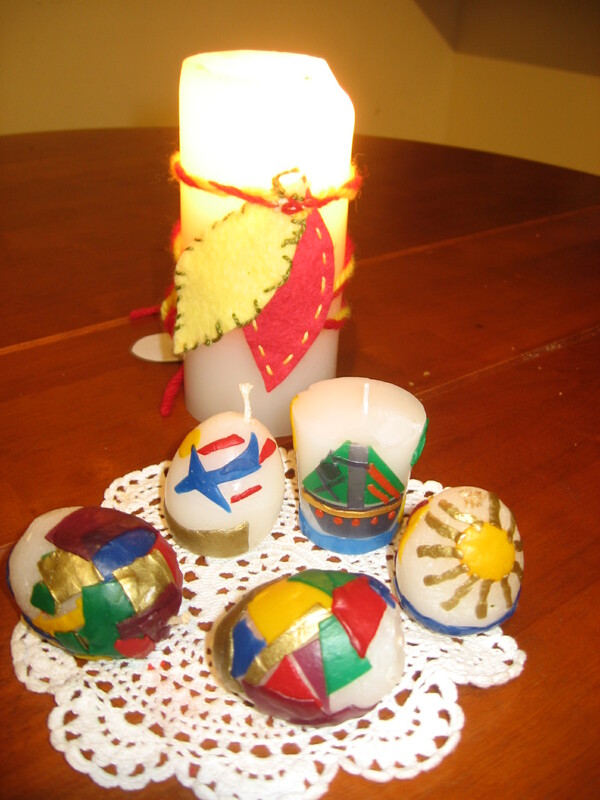 A wax egg candle and a selection of beeswax colours makes a great Easter gift to anyone too.